Radioactive liquid spilled into a river during maintenance work on a nuclear submarine, the Ministry of Defence has confirmed. The Royal Navy said up to 280 litres (62 gallons) of contaminated water spilled from a ruptured hose as it was used to pump out coolant from HMS Trafalgar at the Devonport Naval Base in Plymouth. The incident happened shortly after midnight on Friday and the contaminated liquid spilled into the River Tamar. An MoD spokesman said: “During a standard operation to transfer primary coolant from HMS Trafalgar to an effluent tank on the jetty, a hose ruptured, resulting in a leak of the coolant. A maximum of 280 litres of coolant were discharged from the hose on to the submarine casing, jetty and into the river Tamar. The area was quarantined, monitoring and sampling carried out and a clean-up operation completed. No one was harmed during the incident and the nuclear power plant was unaffected.” The spokesman said that the flow of liquid was stopped as soon as the leak was spotted and initial sampling had not detected, “any radioactive contamination in the local environment”. An investigation is under way to find the cause of the leak and the Environment Agency, Health and Safety Executive and the Defence Nuclear Safety Regulator have been informed. A spokesman for the Environment Agency said it was “certain there is no significant environmental impact” but has taken samples “for reassurance purposes”. New stories are added as I find them. All new links are at the bottom of the page. The greenhouse gases released by the Iraq war thus far equals the pollution from adding 25 million cars to the road for one year says a study released by Oil Change International, an anti petroleum watchdog. The group’s main concerns are the environmental and human rights impacts of a petroleum based economy. The study, released last March on the fifth anniversary of the Iraq War, states that total US spending on the war so far equals the global investment needed through 2030 to halt global warming. Of course skeptics and oil companies will be right to ask how these numbers were calculated. The group claims Iraq war emissions estimates come from combat, oil well fires, increaesd gas flaring, increased cement manufacturing for reconstruction, and explosives. The application of weapons, the destruction of structures and oil fields, fires, military transport movements and chemical spraying are all examples of the destroying impact war may have on the environment. Air, water and soil are polluted, man and animal are killed, and numerous health affects occur among those still living. This page is about the environmental effects of wars and incidents leading to war that have occurred in the 20th and 21st century. In Africa many civil wars and wars between countries occurred in the past century, some of which are still continuing. Most wars are a result of the liberation of countries after decades of colonialization. Countries fight over artificial borders drawn by former colonial rulers. Wars mainly occur in densely populated regions, over the division of scarce resources such as fertile farmland. It is very hard to estimate the exact environmental impact of each of these wars. Here, a summary of some of the most striking environmental effects, including biodiversity loss, famine, sanitation problems at refugee camps and over fishing is given for different countries. Congo war (II) – Since August 1998 a civil war is fought in former Zaire, now known as the Democratic Republic of the Congo (DRC). The war eventually ended in 2003 when a Transitional Government took power. A number of reasons are given for the conflict, including access and control of water resources and rich minerals and political agendas. Currently over 3 million people have died in the war, mostly from disease and starvation. More than 2 million people have become refugees. Only 45% of the people had access to safe drinking water. Many women were raped as a tool of intimidation, resulting in a rapid spread of sexually transmitted diseases such as HIV-AIDS. The war has a devastating effect on the environment. National parks housing endangered species are often affected for exploitation of minerals and other resources. Refugees hunt wildlife for bush meat, either to consume or sell it. Elephant populations in Africa have seriously declined as a result of ivory poaching. Farmers burn parts of the forest to apply as farmland, and corporate logging contributes to the access of poachers to bush meat. A survey by the WWF showed that the hippopotamus population in one national park decreased from 29,000 thirty years previously, to only 900 in 2005. The United Nations Educational, Scientific and Cultural Organization (UNESCO) listed all five parks as ‘world heritage in danger’. Ethiopia & Eritrea – Before 1952, Eritrea was a colony of Italy. When it was liberated, Ethiopia annexed the country. Thirty years of war over the liberation of Eritrea followed, starting in 1961 and eventually ending with the independence of Eritrea in 1993. However, war commenced a year after the country introduced its own currency in 1997. Over a minor border dispute, differences in ethnicity and economic progress, Ethiopia again attacked Eritrea. The war lasted until June 2000 and resulted in the death of over 150,000 Eritrean, and of hundreds of thousands of Ethiopians. During the war severe drought resulted in famine, particularly because most government funds were spend on weapons and other war instrumentation. The government estimated that after the war only 60% of the country received adequate food supplies. The war resulted in over 750,000 refugees. It basically destroyed the entire infrastructure. Efforts to disrupt agricultural production in Eritrea resulted in changes in habitat. The placing of landmines has caused farming or herding to be very dangerous in most parts of the country. If floods occur landmines may be washed into cities. This has occurred earlier in Mozambique. Rwanda civil war – Between April and July 1994 extremist military Hutu groups murdered about 80,000-1,000,000 Tutsis and moderate Hutus in Rwanda. Over 2,000,000 people lost their homes and became refugees. Rwanda has a very rich environment, however, it has a particularly limited resource base. About 95% of the population lives on the countryside and relies on agriculture. Some scientists believe that competition for scarce land and resources led to violence prior to and particularly after the 1994 genocide. It is however stated that resource scarcity only contributed limitedly to the conflict under discussion. The main cause of the genocide was the death of the president from a plane-crash caused by missiles fires from a camp. The many refugees from the 1994 combat caused a biodiversity problem. When they returned to the already overpopulated country after the war, they inhabited forest reserves in the mountains where endangered gorillas lived. 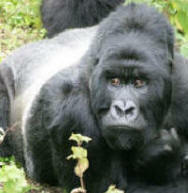 Conservation of gorilla populations was no longer effective, and refuges destroyed part of the habitat. Despite the difficulties still present in Rwanda particularly concerning security and resource provision, an international gorilla protection group is now working on better conditions for the gorillas in Rwanda. Somalia civil war – A civil war was fought in Somalia 1991. One of the most striking effects of the war was over fishing. The International Red Cross was encouraging the consumption of seawater fish to improve diets of civilians. For self-sufficiency they provided training and fishing equipment. However, as a consequence of war Somali people ignored international fishing protocols, thereby seriously harming ecology in the region. Fishing soon became an unsustainable practise, and fishermen are hard to stop because they started carrying arms. They perceive over fishing as a property right and can therefore hardly be stopped. 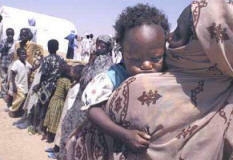 Sudan (Darfur & Chad) – In Sudan civil war and extreme droughts caused a widespread famine, beginning in 1983. Productive farmland in the southern region was abandoned during the war. Thousands of people became refugees that left behind their land, possibly never to return. Attempts of remaining farmers to cultivate new land to grow crops despite the drought led to desertification and soil erosion. The government failed to act for fear of losing its administrative image abroad, causing the famine to kill an estimated 95,000 of the total 3,1 million residents of the province Darfur. As farmers started claiming more and more land, routes applied by herders were closed off. This resulted in conflicts between farmers and rebels groups. In 2003, a conflict was fought in Darfur between Arab Sudanese farmers and non-Arab Muslims. The Muslim group is called Janjaweed, a tribe mainly consisting of nomadic sheep and cattle herders. Originally the Janjaweed were part of the Sudanese and Darfurian militia, and were armed by the Sudanese government to counter rebellion. However, they started utilizing the weapons against non-Muslim civilians. The tribe became notorious for massacre in 2003-2004. In December 2005 the conflict continued across the border, now involving governmental army troops from Chad, and the rebel groups Janjaweed and United Front for Democratic Change from Sudan. In February 2006 the governments of Chad and Sudan signed a peace treaty called the Tripoli Agreement. Unfortunately a new rebel assault of the capital of Chad in April made Chad break all ties with Sudan. The Darfur Conflict so far caused the death of between 50,000 and 450,000 civilians. It caused over 45,000 people to flea the countries of Sudan and Central Africa, into north and east Chad. Most refugees claim they fled civilian attacks from rebel forces, looting food and recruiting young men to join their troops. Pearl Harbor (WWII) – When World War II began, Japan signed the Tripartite Pact with Nazi Germany and Fascist Italy. Consequentially, the United States closed the Panama Canal to Japanese shipping, and initiated a complete oil embargo. Japan, being dependent on US oil, responded to the embargo violently. On December 1941, Japanese troops carried out a surprise attack on Pearl Harbor, Hawaii, aimed at the US Navy stationed there. Despite the awareness that Japan might attack, the US was surprisingly unprepared for the Japanese aggression. There were no aircraft patrols, and anti-aircraft weapons were not manned. For the attack five Japanese submarines were present in the harbor to launch torpedos. One was discovered immediately, and attacked by the USS Ward. All five submarines sank, and at least three of them have not been located since. As Japanese bombers arrived they began firing at US marine airbases across Hawaii, and subsequently battle ships in Pearl Harbor. Eighteen ships sank, including five battleships, and a total of more than 2,000 Americans were killed in action. The explosion of the USS Arizona caused half of the casualties. The ship was hit by a bomb, burned for two days in a row, and subsequently sank to the bottom. The cloud of black smoke over the boat was mainly caused by burning black powder from the magazine for aircraft catapults aboard the ship. Leaking fuel from the Arizona and other ships caught fire, and caused more ships to catch fire. Of the 350 Japanese planes taking part in the attack, 29 were lost. Over sixty Japanese were killed in actions, most of them airmen. Today, three battle ships are still at the bottom of the harbor. Four others were raised and reused. The USS Arizona, being the most heavily damaged ship during the attack, continues to leak oil from the hulk into the harbor. However, the wreck is maintained, because it now serves as part of a war memorial. World Trade Centre explosion – The so-called ‘War on Terrorism’ the United States are fighting in Asia currently all started with the event we recall so well from the shocking images projected on news bulletins. On September 11, 2001, terrorists flew airplanes into the buildings of the World Trade Centre. It is now claimed that the attack and simultaneous collapse of the Twin Towers caused a serious and acute environmental disaster. continues to give up ghosts. As the planes hit the Twin Towers more than 90.000 litres of jet fuel burned at temperatures above 1000oC. An atmospheric plume formed, consisting of toxic materials such as metals, furans, asbestos, dioxins, PAH, PCB and hydrochloric acid. Most of the materials were fibres from the structure of the building. Asbestos levels ranged from 0.8-3.0% of the total mass. PAH comprised more than 0.1% of the total mass, and PCBs less than 0.001% of total mass. At the site now called Ground Zero, a large pile of smoking rubble burned intermittently for more than 3 months. Gaseous and particulate particles kept forming long after the towers had collapsed. The day of the attacks dust particles of various sizes spread over lower Manhattan and Brooklyn, for many miles. Fire fighters and medics working at the WTC were exposed, but also men and women on the streets and in nearby buildings, and children in nearby schools. In vivo inhalation studies and epidemiological studies pointed out the impact of the dust cloud. Health effects from inhaling dust included bronchial hyper reactivity, because of the high alkalinity of dust particles. Other possible health effects include coughs, an increased risk of asthma and a two-fold increase in the number of small-for-gestational-age baby’s among pregnant women present in or nearby the Twin Towers at the time of the attack. After September, airborne pollutant concentrations in nearby communities declined. Many people present at the WTC at the time of the attacks are still checked regularly, because long-term effects may eventually show. It is thought there may be an increased risk of development of mesothelioma, consequential to exposure to asbestos. This is a disease where malignant cells develop in the protective cover of the body’s organs. Airborne dioxins in the days and weeks after the attack may increase the risk of cancer and diabetes. Infants of women that were pregnant on September 11 and had been in the vicinity of the WTC at the time of the attack are also checked for growth or developmental problems. Afghanistan war – In October 2001, the United States attacked Afghanistan as a starting chapter of the ‘War on terrorism’, which still continues today. The ultimate goal was to replace the Taliban government, and to find apparent 9/11 mastermind and Al-Qaeda member Osama Bin Laden. Many European countries assisted the US in what was called ‘Operation Enduring Freedom’. During the war, extensive damage was done to the environment, and many people suffered health effects from weapons applied to destroy enemy targets. It is estimated that ten thousand villages, and their surrounding environments were destroyed. Safe drinking water declined, because of a destruction of water infrastructure and resulting leaks, bacterial contamination and water theft. Rivers and groundwater were contaminated by poorly constructed landfills located near the sources. Afghanistan once consisted of major forests watered by monsoons. During the war, Taliban members illegally trading timber in Pakistan destroyed much of the forest cover. US bombings and refugees in need of firewood destroyed much of what remained. Less than 2% of the country still contains a forest cover today. Bombs threaten much of the country’s wildlife. One the world’s important migratory thoroughfare leads through Afghanistan. The number of birds now flying this route has dropped by 85%. In the mountains many large animals such as leopards found refuge, but much of the habitat is applied as refuge for military forces now. Additionally, refugees capture leopards and other large animals are and trade them for safe passage across the border. Pollution from application of explosives entered air, soil and water. One example is cyclonite, a toxic substance that may cause cancer. Rocket propellants deposited perchlorates, which damage the thyroid gland. Numerous landmines left behind in Afghan soils still cause the deaths of men, women and children today. Cambodia civil war – In 1966 the Prince of Cambodia began to lose the faith of many for failure to come to grips with the deteriorating economic situation. In 1967 rebellion started in a wealthy province where many large landowners lives. Villagers began attacking the tax collection brigade, because taxes were invested in building large factories, causing land to be taken. This led to a bloody civil war. Before the conflict could be repressed 10,000 people had died. The rebellion caused the up rise of the Khmer Rouge, a Maoist-extremist organization that wanted to introduce communism in the country. In 1975 the organization, led by Pol Pot, officially seized power in Cambodia. The Khmer considered farmers (proletarians) to be the working class, as did Mao in China earlier. Schools, hospitals and banks were closed, the country was isolated from all foreign influence, and people were moved to the countryside for forced labor. People were obligated to work up to 12 hours a day, growing three times as many crops, as was usually the case. Many people died there from exhaustion, illness and starvation, or where shot by the Khmer on what was known as ‘The Killing Fields’. The Khmer Rouge regime resulted in deforestation, caused by extensive timber logging to finance war efforts, agricultural clearance, construction, logging concessions and collection of wood fuels. A total 35% of the Cambodian forest cover was lost under the Maoist regime. Deforestation resulted in severe floods, damaging rice crops and causing food shortages. In 1993, a ban on logging exports was introduced to prevent further flooding damage. In 1979 the Khmer Rouge regime ended with an invasion by Vietnam, and the installation of a pro-Vietnamese puppet government. Subsequently, Thai and Chinese forces attempted to liberate the country from Vietnamese dominance. Many landmines were placed in the 1980’s, and are still present in the countryside. They deny agricultural use of the land where they are placed. In 1992 free elections were introduced, but the Khmer Rouge resumed fighting. Eventually, half of the Khmer soldiers left in 1996, and many officials were captured. Under the Khmer regime, a total of 1.7 million people died, and the Khmer was directly responsible for about 750,000 of those casualties. Hiroshima & Nagasaki nuclear explosions – Atomic bombs are based on the principle of nuclear fission, which was discovered in Nazi Germany in 1938 by two radio chemists. During the process, atoms are split and energy is released in the form of heat. Controlled reactions are applied in nuclear power plants for production of electricity, whereas unchecked reactions occur during nuclear bombings. The invention in Germany alarmed people in the United States, because the Nazi’s in possession of atomics bombs would be much more dangerous than they already where. When America became involved in WWII, the development of atomic bombs started there in what was called the ‘Manhattan Project’. In July 1945 an atomic bomb was tested in the New Mexico desert. The tests were considered a success, and America was now in possession of one of the world’s deadliest weapons. In 1945, at the end of World War II and the beginning of the Cold War, nuclear weapons were applied to kill for the first time in Japan. On August 6, a uranium bomb by the name of Little Boy was dropped on Hiroshima, followed by a plutonium bomb by the name of Fat Man on Nagasaki on August 9. The reason Hiroshima was picked was that it was a major military centre. The bomb detonated at 8.15 p.m. over a Japanese Army parade field, where soldiers were already present. Nagasaki was picked because it was an industrial centre. The bomb, which was much larger than that used on Hiroshima, exploded at 11.02 a.m. at an industrial site. However, the hills on and the geographical location of the bombing site caused the eventual impact to be smaller than days earlier in Hiroshima. The first impact of the atomic bombings was a blinding light, accompanied by a giant wave of heat. Dry flammable materials caught fire, and all men and animals within half a mile from the explosion sites died instantly. 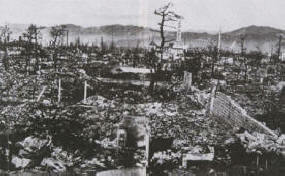 Many structures collapsed, in Nagasaki even the structures designed to survive earthquakes were blasted away. Many water lines broke. Fires could not be extinguished because of the water shortage, and six weeks after the blast the city still suffered from a lack of water. In Hiroshima a number of small fires combined with wind formed a firestorm, killing those who did not die before but were left immobile for some reason. Within days after the blasts, radiation sickness started rearing its ugly head, and many more people would die from it within the next 5 years. In Hiroshima 100,000 were killed instantly, and between 100,000 and 200,000 died eventually. In Nagasaki about 40,000 were killed instantly, and between 70,000 and 150,000 died eventually. The events of August 6 and August 9 can be translated into environmental effects more literally. The blasts caused air pollution from dust particles and radioactive debris flying around, and from the fires burning everywhere. Many plants and animals were killed in the blast, or died moments to months later from radioactive precipitation. Radioactive sand clogged wells used for drinking water winning, thereby causing a drinking water problem that could not easily be solved. Surface water sources were polluted, particularly by radioactive waste. Agricultural production was damaged; dead stalks of rice could be found up to seven miles from ground zero. In Hiroshima the impact of the bombing was noticeable within a 10 km radius around the city, and in Nagasaki within a 1 km radius. Iraq & Kuwait – The Gulf War was fought between Iraq, Kuwait and a number of western countries in 1991. Kuwait had been part of Iraq in the past, but was liberated by British imperialism, as the Iraqi government described it. In August 1990, Iraqi forces claimed that the country was illegally extracting oil from Iraqi territory, and attacked. The United Nations attempted to liberate Kuwait. Starting January 1991, Operation Desert Storm began, with the purpose of destroying Iraqi air force and anti-aircraft facilities, and command and control facilities. The battle was fought in Iraq, Kuwait and the Saudi-Arabian border region. Both aerial and ground artillery was applied. Late January, Iraqi aircraft were flown to Iran, and Iraqi forces began to flee. The Gulf War was one of the most environmentally devastating wars ever fought. Iraq dumped approximately one million tons of crude oil into the Persian Gulf, thereby causing the largest oil spill in history (see environmental disasters). Approximately 25,000 migratory birds were killed. The impact on marine life was not as severe as expected, because warm water sped up the natural breakdown of oil. Local prawn fisheries did experience problems after the war. Crude oil was also spilled into the desert, forming oil lakes covering 50 square kilometres. In due time the oil percolated into groundwater aquifers. Fleeing Iraqi troops ignited Kuwaiti oil sources, releasing half a ton of air pollutants into the atmosphere. Environmental problems caused by the oil fires include smog formation and acid rain. Toxic fumes originating from the burning oil wells compromised human health, and threatened wildlife. A soot layer was deposited on the desert, covering plants, and thereby preventing them from breathing. Seawater was applied to extinguish the oil fires, resulting in increased salinity in areas close to oil wells. It took about nine months to extinguish the fires. During the war, many dams and sewage water treatment plants were targeted and destroyed. A lack of possibilities for water treatment resulting from the attacks caused sewage to flow directly into the Tigris and Euphrates rivers. Additionally, pollutants seeped from bombed chemical plants into the rivers. Drinking water extracted from the river was polluted, resulting in widespread disease. For example, cases of typhoid fever have increased tenfold since 1991. Movement of heavy machinery such as tanks through the desert damaged the brittle surface, causing soil erosion. Sand was uncovered that formed gradually moving sand dunes. These dunes may one day cause problems for Kuwait City. Tanks fired Depleted Uranium (DU) missiles, which can puncture heavy artillery structures. DU is a heavy metal that causes kidney damage and is suspected to be teratogenic and carcinogenic. Post-Gulf War reports state an increase in birth defects for children born to veterans. The impact of Depleted Uranium could not be thoroughly investigated after the Gulf War, because Saddam Hussein refused to cooperate. Its true properties were revealed after the Kosovo War in 2001 (description below). DU has now been identified as a neurotoxin, and birth defects and cancers are attributed to other chemical and nerve agents. However, it is stated that DU oxides deposited in the lungs of veterans have not been thoroughly researched yet. It was later found that this may cause kidney and lung infections for highly exposed persons. After the Gulf War many veterans suffered from a condition now known as the Gulf War Syndrome. The causes of the illness are subject to widespread speculation. Examples of possible causes are exposure to DU (see above), chemical weapons (nerve gas and mustard gas), an anthrax vaccine given to 41% of US soldiers and 60-75% of UK soldiers, smoke from burning oil wells and parasites. Symptoms of the GWS included chronic fatigue, muscle problems, diarrhoea, migraine, memory loss, skin problems and shortness of breath. Many Gulf War veterans have died of illnesses such as brain cancer, now acknowledged as potentially connected to service during the war. Iraq & the United States – The war in Iraq started by the United States in 2003 as part of the War on Terrorism causes poverty, resulting in environmental problems. Long-term environmental effects of the war remain unclear, but short-term problems have been identified for every environmental compartment. For example, some weapons are applied that may be extremely damaging to the environment, such as white phosphorus ammunition. People around the world protest the application of such armoury. Damage to sanitation structures by frequent bombing, and damage to sewage treatment systems by power blackouts cause pollution of the River Tigris. Two hundred blue plastic containers containing uranium were stolen from a nuclear power plant located south of Baghdad. The radioactive content of the barrels was dumped in rivers and the barrels were rinsed out. Poor people applied the containers as storage facility for water, oil and tomatoes, or sold them to others. Milk was transported to other regions in the barrels, making it almost impossible to relocate them. Oil trenches are burning, as was the case in the Gulf War of 1991, resulting in air pollution. In Northern Iraq, a sulphur plant burned for one month, contributing to air pollution. As fires continue burning, groundwater applied as a drinking water source may be polluted. Military movements and weapon application result in land degradation. The destruction of military and industrial machinery releases heavy metals and other harmful substances. Israel & Lebanon – In July 2006, Hezbollah initiated a rocket attack on Israeli borders. A ground patrol killed and captured Israeli soldiers. This resulted in open war between Israel and Lebanon. The war caused environmental problems as Israelis bombed a power station south of Beirut. Damaged storage tanks leaked an estimated 20,000 tons of oil into the Mediterranean Sea. The oil spill spread rapidly, covering over 90 km of the coastline, killing fish and affecting the habitat of the endangered green sea turtle. A sludge layer covers Beaches across Lebanon, and the same problem may occur in Syria as the spill continues to spread. Part of the oil spill burned, causing widespread air pollution. Smog affects the health of people living in the city of Beirut. So far problems limiting the clean-up operation of oil spills have occurred, because of ongoing violence in the region. Another major problem were forest fires in Northern Israel caused by Hezbollah bombings. A total of 9,000 acres of forest burned to the ground, and fires threaten tree reserves and bird sanctuaries. Russia & Chechnya – In 1994 the First Chechen War of independence started, between Russian troops, Chechen guerrilla fighters and civilians. Chechnya has been a province of Russia for a very long time and now desires independence. The First War ended in 1996, but in 1999 Russia again attacked Chechnya for purposes of oil distribution. The war between the country and its province continues today. It has devastating effects on the region of Chechnya. An estimated 30% of Chechen territory is contaminated, and 40% of the territory does not meet environmental standards for life. Major environmental problems include radioactive waste and radiation, oil leaks into the ground from bombarded plants and refineries, and pollution of soil and surface water. Russia has buried radioactive waste in Chechnya. Radiation at some sites is ten times its normal level. Radiation risks increase as Russia bombs the locations, particularly because after 1999 the severeness of weaponry increased. A major part of agricultural land is polluted to the extent that it can no longer meet food supplies. This was mainly caused by unprofessional mini-refineries of oil poachers in their backyards, not meeting official standards and causing over 50% of the product to be lost as waste. Groundwater pollution flows into the rivers Sunzha and Terek on a daily basis. On some locations the rivers are totally devoid of fish. Flora and fauna are destroyed by oil leaks and bombings. Vietnam war – The Vietnam War started in 1945 and ended in 1975. It is now entitled a proxy war, fought during the Cold War between the United States and the Soviet Union to prevent the necessity for the nations to fight each other directly. North Vietnam fought side by side with the Soviet Union and China, and South Vietnam with the United States, New Zealand and South Korea. It must be noted that the United States only started to be actively involved in the battle after 1963. Between 1965 and 1968 North Vietnam was bombed under Operation Rolling Thunder, in order to force the enemy to negotiate. Bombs destroyed over two million acres of land. North Vietnam forces began to strike back, and the Soviet Union delivered anti-aircraft missiles to North Vietnam. The ground war of US troops against the Viet Cong began. The United States would not retreat from Vietnam until 1973, and during those years extremely environmentally damaging weapons and war tactics were applied. A massive herbicidal programme was carried out, in order to break the forest cover sheltering Viet Cong guerrillas, and deprive Vietnamese peasants of food. The spraying destroyed 14% of Vietnam’s forests, diminished agricultural yield, and made seeds unfit for replanting. If agricultural yield was not damaged by herbicides, it was often lost because military on the ground set fire to haystacks, and soaked land with aviation fuel en burned it. A total of 15,000 square kilometres of land were eventually destroyed. Livestock was often shot, to deprive peasant of their entire food supply. A total of 13,000 livestock were killed during the war. The application of 72 million litres of chemical spray resulted in the death of many animals, and caused health effects with humans. One chemical that was applied between 1962 and 1971, called Agent Orange, was particularly harmful. Its main constituent is dioxin, which was present in soil, water and vegetation during and after the war. Dioxin is carcinogenic and teratogenic, and has resulted in spontaneous abortions, chloracne, skin and lung cancers, lower intelligence and emotional problems among children. Children fathered by men exposed to Agent Orange during the Vietnam War often have congenital abnormalities. An estimated half a million children were born with dioxin-related abnormalities. Agent Orange continues to threaten the health of the Vietnamese today. To fight communism in a foreign land. Agent Orange is sprayed on the trees. Irate my eyes, burns through my clothes. To be told “You have cancer, son”. Government caused your suffering and pain. Brass cover-up, not wanting anyone to know. Medical Insurance have been denied. My health I hope to retrieve. Today, agriculture in Vietnam continues to suffer problems from six million unexploded bombs still present. Several organisations are attempting to remove these bombs. Landmines left in Vietnam are not removed, because the Vietnamese government refuses to accept responsibility. Kosovo war – The Kosovo war can be divided up in two separate parts: a conflict between Serbia and Kosovo, and a conflict between Kosovo and the North Atlantic Treaty Organisation (NATO). The first conflict originated in 1996 from the statement of Slobodan Milocevic that Kosovo was to remain a part of Serbia, and from the resulting violent response of Albanian residents. When Serbian troops slaughtered 45 Albanians in the village of Racak in Kosovo in 1999, the NATO intervened. NATO launched a 4-month bombing campaign upon Serbia as a reply to the massacre at Racak. The United Nations Environment Programme (UNEP) investigated the environmental impact of the Kosovo war. It was concluded that the war did not result in an environmental disaster affecting the entire Balkan region. Nevertheless, some environmental hot spots were identified, namely Belgrade, Pancevo, Kragujevac, Novi Sad and Bor. Bombings carried out by the United States resulted in leakages in oil refineries and oil storage depots. Industrial sites containing other industries were also targeted. EDC (1,2-dichloroethane), PCBs en mercury escaped to the environment. Burning of Vinyl Chloride Monomer (VCM) resulted in the formation of dioxin, hydrochloric acid, carbon monoxide and PAHs, and oil burning released sulphur dioxide, nitrogen dioxide, carbon monoxide, lead and PAHs into the air. Heavy clouds of black smoke forming over burning industrial targets caused black rain to fall on the area around Pancevo. Some damage was done to National Parks in Serbia by bombings, and therefore to biodiversity. EDC, mercury and petroleum products (e.g. PCBs) polluted the Danube River. These are present in the sediments and may resurface in due time. EDC is toxic to both terrestrial and aquatic life. Mercury may be converted into methyl mercury, which is very toxic and bio accumulates. As a measure to prevent the consequences of bombing, a fertilizer plant in Pancevo released liquid ammonia into the Danube River. This caused fish kills up to 30 kilometres downstream. In 1999 when NATO bombed Belgrade, the capital of Serbia, the resulting environmental damage was enormous. Petrochemical plants in suburbs started leaking all kinds of hazardous chemicals into air, water and soil. Factories producing ammonia and plastics released chlorine, hydrochloric acid, vinyl chloride and other chlorine substances, resulting in local air pollution and health problems. Water sources were polluted by oil leaking from refineries. The Danube River was polluted by oil more severely, but this time hydrochloric acid and mercury compounds also ended up there. These remained in the water for a considering period of time and consequently ended up in neighbouring countries Rumania and Bulgaria. Clean drinking water supplies and waste treatment plants were damaged by NATO bombings. Many people fled their houses and were moved to refugee camps, where the number of people grew rapidly. A lack of clean drinking water and sanitation problems occurred. Like in the Gulf War, Depleted Uranium (DU) was applied in the Kosovo War to puncture tanks and other artillery. After the war, the United Kingdom assisted in the removal of DU residues from the environment. Veterans complained of health effects. It was acknowledged by the UK and the US that dusts from DU can be dangerous if inhaled. Inhalation of dust most likely results in chemical poisoning. World War I: Trench Warfare – In 1914, the assassination of archduke Franz Ferdinand of Austria-Hungary resulted in the First World War, otherwise known as The Great War, or WWI. It started with Austria-Hungary invading Serbia, where the assassin came from, and Germany invading Belgium. The war was mostly in Europe, between the Allies and the Central Powers. The war was fought from trenches, dug from the North Sea to the border of Switzerland. In 1918 when the war was over, empires disintegrated into smaller countries, marking the division of Europe today. Over 9 million people had died, most of which perished from influenza after the outbreak of the Spanish Flu (see environmental disasters). The war did not directly cause the influenza outbreak, but it was amplified. Mass movement of troops and close quarters caused the Spanish Flu to spread quickly. Furthermore, stresses of war may have increased the susceptibility of soldiers to the disease. In terms of environmental impact, World War I was most damaging, because of landscape changes caused by trench warfare. Digging trenches caused trampling of grassland, crushing of plants and animals, and churning of soil. Erosion resulted from forest logging to expand the network of trenches. Soil structures were altered severely, and if the war was never fought, in all likelihood the landscape would have looked very differently today. Another damaging impact was the application of poison gas. 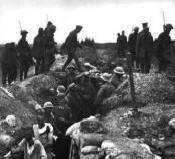 Gases were spread throughout the trenches to kill soldiers of the opposite front. Examples of gases applied during WWI are tear gas (aerosols causing eye irritation), mustard gas (cell toxic gas causing blistering and bleeding), and carbonyl chloride (carcinogenic gas). The gases caused a total of 100,000 deaths, most caused by carbonyl chloride (phosgene). Battlefields were polluted, and most of the gas evaporates into the atmosphere. After the war, unexploded ammunition caused major problems in former battle areas. Environmental legislation prohibits detonation or dumping chemical weapons at sea, therefore the cleanup was and still remains a costly operation. In 1925, most WWI participants signed a treaty banning the application of gaseous chemical weapons. Chemical disarmament plants are planned in France and Belgium. World War II: – World War II was a worldwide conflict, fought between the Allies (Britain, France and the United States as its core countries) and the Axis Powers (Germany, Italy and Japan as its core countries). It started with the German invasion of Poland and Czechoslovakia in 1939, and ended with the liberation of Western Europe by the allies in 1945. Estimates for the total casualties of the war vary, but most suggest that some 60 million people died in the war, including about 20 million soldiers and 40 million civilians. World War II: Hunger winter – In late 1944, the allied troops attempted to liberate Western Europe. As they reached The Netherlands, German resistance caused the liberation to be halted in Arnhem, as allied troops failed to occupy a bridge over the River Rhine. As the Dutch government in exile in Britain called for railway strikes, the Germans responded by putting embargo on food transport to the west. This resulted in what is now known as the Hunger Winter, causing an estimated 20,000-25,000 Dutch to starve to death. A number of factors caused the starvation: a harsh winter, fuel shortages, the ruin of agricultural land by bombings, floods, and the food transport embargo. Most people in the west lived off tulip bulbs and sugar beet. Official food rations were below 1000 cal per person per day. In May 1945 the Hunger Winter ended with the official liberation of the west of The Netherlands. The there is this. So what do they do with weapons of mass destruction? Coming to an Ocean Near YOU! The cost in dollars for the pollution caused by war is staggering. The cost to human life is horrendous. The price of war to the Environment is deadly. This is of course a Global problem. What you don’t see can hurt you. If you don’t know it is only because they don’t want you too. They will never tell you the true unless we as a Global community force them to. This will affect our children for many years to come. War is probably one of the worst polluters on the planet. Stopping the WAR MACHINE is in everyone’s best interest. Here you find tons of weapons that were dumped into the oceans among other things. The US Dumps staggering amounts of Chemical weapons in the oceans. The US still air testing bombs in the US. This to is a form of pollution a very deadly one. This is part of the war pollution as well. Addiction is also part of war pollution. Because of the NATO and US invasion in Afghanistan, Heroin addiction has grown like wildfire around the world. Millions are now addicted to Heroin. More Toxic waste for Veterans to deal with.